Lanky and sun-kissed and usually clad in some sort of vintage aloha wear, Meleana Estes has the youthful energy of a teenage surfer. She pulls up to the bridal shower I’m attending and the trunk of her SUV resembles a veritable jungle. Leaves and fronds of every size and shade of green lay next to piles of raffia and spray bottles. Blooms pruned to bite-sized pieces in a riot of color overflow from lauhala baskets. These are the tools of her trade, and she will deftly wrap and bind them together like a pro while we in her haku lei-making workshop awkwardly struggle to hold the parts together with all of our fingers and toes and some clothes pins. A haku lei, or lei po’o, is a lei made for the head (haku literally means “to braid”). The tradition of making and giving lei stems from ancient Hawai’i, when lei were used as for ceremonial purposes, as adornment, and to signify rank. Later, with the growth of the tourist industry, they were used as a gift for those arriving or leaving. Photo: The ubiquitous purple orchid lei is the most common of lei in Hawai’i. While the music-festival-flower-crown craze was certainly inspired by the Hawaiian haku, it has never been a trend or fashion statement in Hawai’i. Instead it usually comes as a gift, made for a special occasion, be it a birthday or wedding or baby luau. While flower crowns frequently use some sort of wire, a haku lei is made around a base of raffia or other natural material. 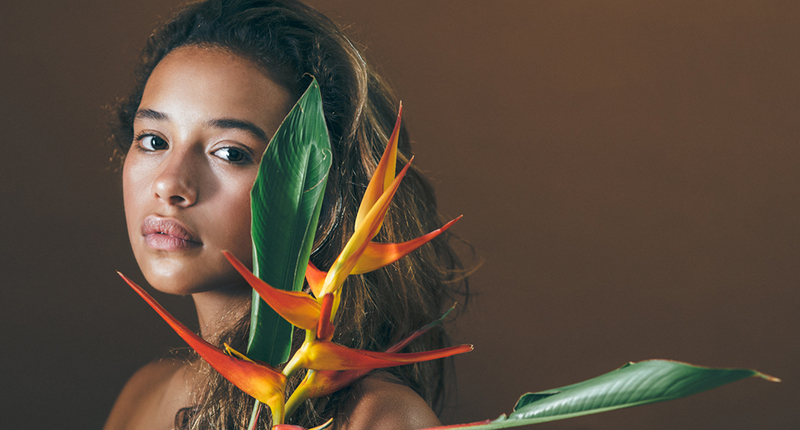 “Im actually really grateful to the flower crown trend because it’s brought an awareness to flowers and made natural materials part of peoples wear,” says Meleana. It has certainly helped make her one of the island’s most in-demand flower designers. Flowers play a huge role in the culture of Hawai’i. The lush, tropical climate and fertile volcanic soil make it possible for most anything to grow, and over centuries various species have made their way to the islands either naturally, by canoe with the first Polynesian settlers, or in modern times from visitors the world over. The most popular flower lei in Hawai’i reflect this diverse background. Leaves from the ti plant are twisted in to an open-ended lei and combined with tuberose from Mexico. Kukui (candlewood) nuts brought with the first Polynesians are woven with invasive sea grapes, while maile leaves, from a vine native to Hawai’i, are woven into an open-ended lei that rests on the shoulders of the groom and delicate strands of fragrant pikake (Arabian Jasmine), originally brought to Hawai’i by Chinese immigrants, adorn the shoulders of the bride. Photo: Meleana made Brandon’s traditional ti leaf lei in the haku style (to braid) as they do in Tahiti. As a child in Hawai’i you learn to make a lei from the fallen blossoms of the plumeria (frangipani) tree, a staple in backyards across the state. In colors ranging from white to pink to deep maroon, and with a built-in hole, they make for the best homemade lei, thick and uneven and bathing you in the most delicious scent. When it comes to a lei, looks can be deceiving. The bright purple orchid lei, ubiquitous in every grocery cooler and on the necks of tourists the islands over, scream tropical vacation. In reality, the flowers are imported from Thailand and are more style than substance as they are odorless. True connoisseurs know that nothing beats the pua kenikeni, a unassuming flower in white or mustard yellow that bruises within hours with the most overwhelmingly beautiful perfume. Photo: Emily wears a crown of plumeria, one of the most common and popular flowers in Hawai’i and often used in lei. Traditionally, before people started adding store-bought flowers, a haku lei was made of ti or palapawai fern leaves. You can still see these traditional styles in Hawaiian hula competitions. “When you dance hula, the lei is made to reflect what the song is about. So if the song is about a certain place, the lei is associated with that place,” explains Meleana. 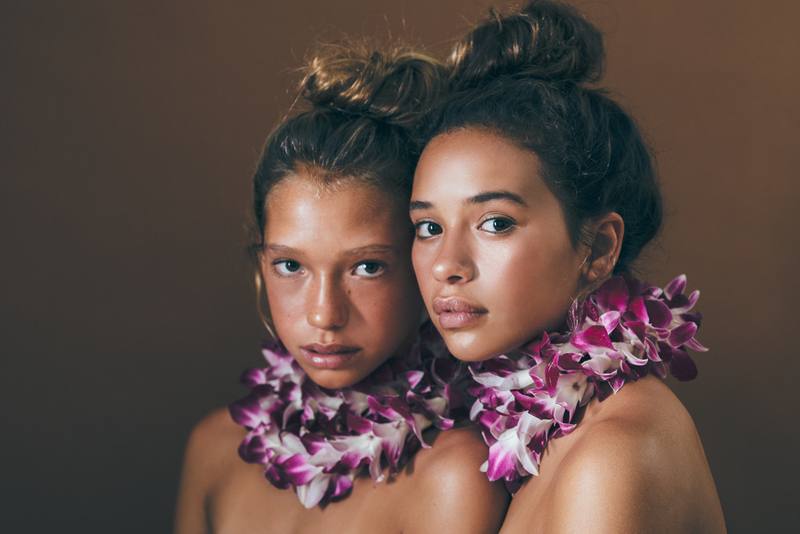 From a young age, Meleana learned the art of lei making at the feet of her grandmother, renowned lei-maker Amelia Ana Kaopua Bailey, cleaning and arranging flowers and learning how to wili (weave). “Tutu was pretty meticulous and always very busy, so she had to be willing to be patient with you and take the time, and you had to be willing to give her the time,” she says. While her grandmother Amelia grew up in a Hawaiian family, it wasn’t until much later in life that she would learn to make lei. After the American military overthrew the Hawaiian monarchy in 1893, most all aspects of Native Hawaiian culture—from language to dance to traditions—were outlawed or repressed and subsequently much of them were lost for generations. The Hawaiian Renaissance of the 1970s, inspired by the civil rights movement taking place on the mainland, brought a new awakening of native language, dance, customs, and knowledge and soon a whole generation was hungry to learn more about its past. Hawaiian activism grew, Hawaiian music became popular, and the native voyaging canoe Hōkūle’a made its inaugural sail from Hawai’i to Tahiti in 1976 by navigating only by the sky as Hawaiians had done in ancient times. It was during this era, when Amelia was 50 years old, that she was asked to judge the annual May Day lei contest. 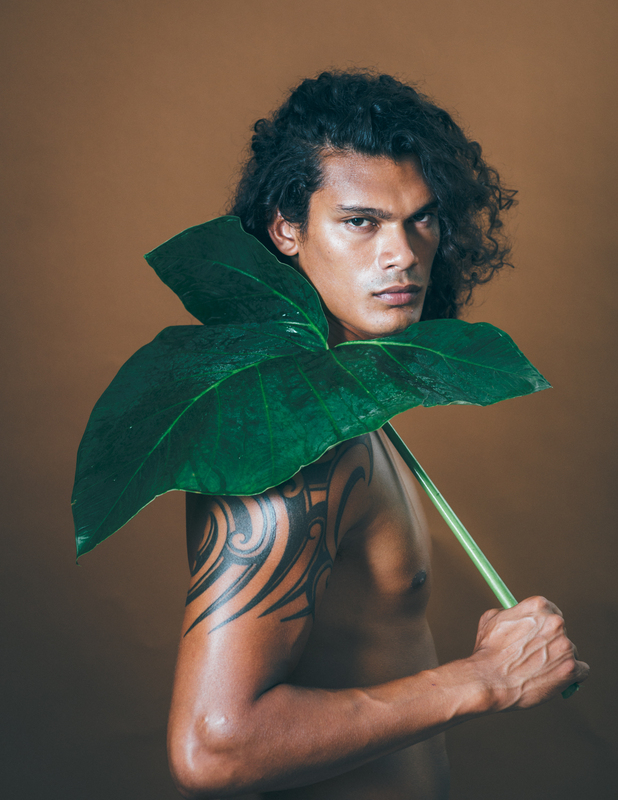 Photo: Patrick carries the leaf of the taro plant, an essential part of Native Hawaiian diet and culture. Photo: Anu holds a heliconia, a tropical flower found in the jungles of Hawai‘i and a favorite of Meleana to use in her floral arrangements. Photo: Meleana made Pua’s headpiece of palapalai fern, a plant indigenous to Hawai’i used frequently in hula dance. Her family made lei for most any special occasion, and even when Meleana was younger and running all around, she could still sit and make a beautiful lei. It wasn’t until after college and especially after her grandmother passed away and Meleana inherited her house that she focused on lei making as her calling.